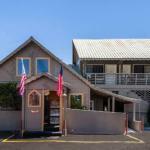 Free Wi-Fi complimentary breakfast and value rates entice guests at the pet-friendly Midway Inn South Lake Tahoe. All 21 rooms at the two-story Midway offer free Wi-Fi cable TV microwaves refrigerators coffeemakers hairdryers complimentary local calling and irons with ironing boards. Kick-start your day at the hotel's free continental breakfast and make time for a quick warm up in the fitness room before hitting the slopes. Pets are welcome at no charge. Parking is free. The Midway is a three-block walk from Heavenly Village's shopping dining and movie theater. The casinos over the Nevada border are about two miles away. Outdoorsy types enjoy beautiful Emerald Bay State Park a 15-minute drive from the hotel. Regan Beach is two miles away and Reno-Tahoe International Airport is 55 miles north.